I’m keen to share a little more about the combined English (or ESOL) and permaculture class of the previous post. It was a very special program and I'm grateful to have had the opportunity to be involved with it. 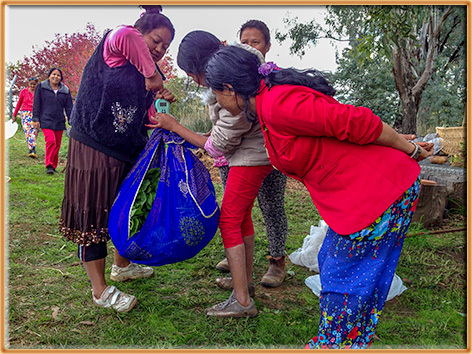 The aim was to help students to learn about the value of the food-growing skills they had from past experience, while providing the Australian context. In some areas there are big differences between the students’ previous experience and food growing in Albury (or even Australia more broadly). You can imagine there are some challenges to growing here when you're used to metres of rich top soil, a hot wet season where everything grows like in a jungle with no need to irrigate and you've grown plants that thrive in that environment. When Lou Bull and I became involved in teaching this class (stepping into a role Bec Chettleburgh had previously) we brought some of our passions and interests to the existing mix. 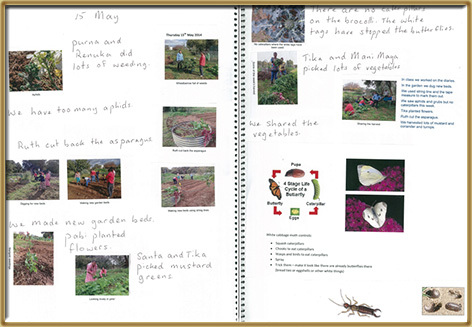 For instance, we'd photograph the class in the garden and they would practice their writing and then reading, to create a garden journal of our activities from the photos. We sought to design and work the garden as a market garden - standardising the beds, recording the yields, using crop rotation and practicing skills that help to increase students' employability in the horticulture industry, as well as ways they can grow food in rental accommodation (a challenge in itself). We incorporated things from previous classes such as looking at beneficial and pest species in the system, organic approaches to soil improvement, pest and disease management and added our own interests too. We made hot composts; looked after the chooks; learnt about safety; even participated in the Wild Pollinator Count. In the garden the class grew a mix of plants, particularly those that the students like to eat and that are hard and/or expensive for them to access. For example, mustard greens, daikon radish and coriander were very popular. But we also tried to encourage growing (and eating!) 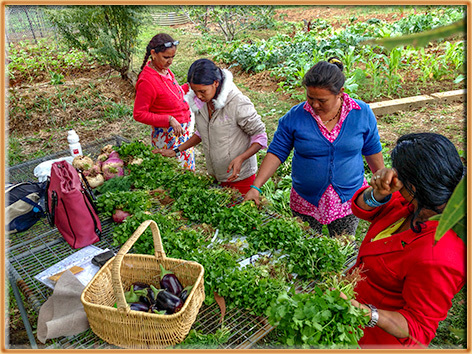 other vegetables that grow well in our region, and/or that might work in their curries and favorite dishes. Image: the garden in winter. Comprising approximately 30 rows, 8-10 metres long. If you've got really good eyes you might see the broad beans, coriander and green manures, brassicas, garlic, other leafy greens, peas, daikon radish, asparagus and onions. The trees within and around the patch are stone fruit and figs. As a class each week we'd harvest any food that was ready, they'd weigh and record it and then carefully divide it up between themselves to take home. We had occasional cooking sessions, and the students prepared a feast that included class-grown food along with organic meat from the TAFE farm and all the campus staff were invited to join in the lunch (with appropriate warnings as to the chilli factor for particular dishes!). Up next, in the final post of this little series, I'll reflect on what I learnt from being a part of this program.